THE CANADIAN PRESS -- CALGARY - There were a few grumbles among Calgarians on Thursday when Prince William and Kate initially appeared to pass on a decades-old tradition, but for others it was hats off to the royals for fulfilling the wish of a sick little girl. In the midst of strong winds, the couple did not immediately don the cowboy hats presented to them by Calgary Mayor Naheed Nenshi upon their arrival in the city -- a 60-year-old ceremony called "white hatting." Instead, the Duchess of Cambridge quickly turned her attention to Diamond Marshall, a six-year-old girl decked out in a pretty pink dress with a matching band encircling her bald head. Diagnosed with from Stage 4 undifferentiated sarcoma last December, Diamond had two life-saving surgeries in recent months and had spent nearly a month in intensive care. The youngster's biggest wish was to one day meet a "real princess." She had written Kate a note from the hospital bed where she watched the royal wedding earlier this year, and the Children's Wish Foundation went to work. As the royal couple emerged from their helicopter, strong winds forced Kate to pull her long hair out of her face and she struggled to keep her primrose dress from flying up. Diamond ran up to her, thrust a handmade gift and flowers toward the smiling Duchess and then bolted back to the safety of her parents. Kate entreated the shy little girl to come back and after they exchanged a few words they gave each other a hug. "She was beautiful," an enthralled Diamond later told reporters, her words muffled as she tired to hide her face in her dad Lyall's chest. "This is a big boost for her and we're very proud of her," her visibly moved father said. "It's a big win for all our family and friends, it's great." The heart-warming airport encounter marked the beginning of a busy couple of days for the royals in Calgary. The couple's arrival in Cowtown after a private break -- reports say they spent the night at a remote Rocky Mountain lodge near Lake Louise, Alta. -- coincided with the kickoff to the world-famous Calgary Stampede, the 10-day exhibition and rodeo that celebrates the western way of life. The Duke and Duchess of Cambridge will have a full plate as they wrap up their nine-day Canadian visit. They were to tour a high-tech laboratory at the University of Calgary before attending a reception with host Prime Minister Stephen Harper. The couple will be given a brief bull-riding demonstration and the prince is to have his picture taken as he throws a stove into the back of a chuckwagon. On Friday, they are to open the Stampede parade, visit the zoo and meet homeless youth, attend an Alberta government reception and lay a wreath before leaving Canada and heading to Los Angeles. The couple's choice not to don the hats on the windy tarmac raised a few eyebrows among those gathered to greet them. "Ohhhh!" gasped Candice Chow, who had camped overnight with her son Kristian to get one of the coveted wristbands allowing them to attend a rodeo demonstration that that William and Kate later attended. "They're welcomed anyhow," she added with a laugh. "Maybe she'll put it on later." Indeed, they did. 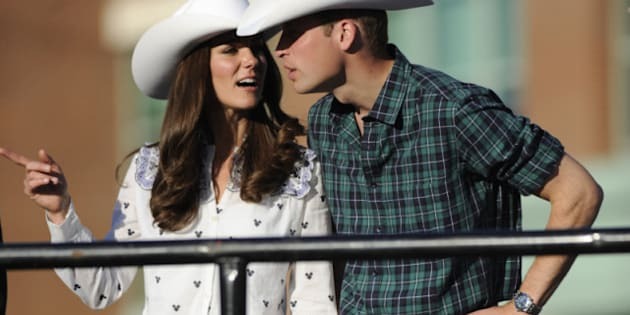 In just a couple of hours, while attending the outdoor event, William and Kate emerged before the crowd wearing their custom-made, white Smithbilt hats, which are considered Calgary's version of the key to the city. The white-hatting ceremony representing the city's cowboy culture and pioneering past has been celebrated by dignitaries ranging from the Dalai Lama to Dr. Phil. Previous members of the Royal Family to be white-hatted include Prince Philip, Prince Andrew and Prince Edward. Philip, who received his third cowboy cover in 1969, ruffled some feathers when he quipped about not knowing what to do with another hat other than to carry water or plant flowers in it. That prompted the city to give Prince Charles a black cowboy hat when he arrived eight years later. Other white hatters include Pope John Paul II, Princess Margriet of the Netherlands, U.S. Gen. David Petraeus, former U.S. president George W. Bush, former British prime minister Tony Blair, Italian Prime Minister Silvio Berlusconi and Russian President Vladimir Putin. On the entertainment side, add Oprah Winfrey, Kevin Costner, Robert Duvall, Luciano Pavarotti, Tommy Chong and even Ozzy Osbourne.